The Isle of Iona is a small island off the west coast of Scotland, where in 563 A.D., Saint Columba founded an influential Celtic monastery. In the middle ages, Iona was the site of a Benedictine Abbey, and has attracted many thousands of people on their own pilgrim journey for centuries. 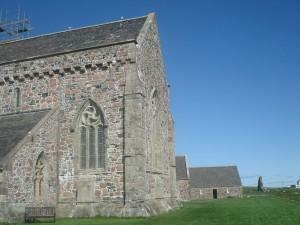 The Iona Community was founded in 1938 by the Rev George MacLeod, who was a parish minister in Glasgow. Today, the Iona Community is an ecumenical community committed to seeking new ways of working for peace and social justice, rebuilding community, and renewing worship. John Oliver Nelson, the founder of Kirkridge Retreat and Study Center, was influenced by George MacLeod’s work on the island of Iona. For both men, the building of community was a critical piece of their visions for their work in the world. At Kirkridge, we continue to live through the dream that John Oliver Nelson and George MacLeod had for this holy mountain. Both communities today still believe that time for spiritual renewal and community are critical components necessary to working towards a more just and peaceful world.